Marvelous Multiagers! : Table of Contents?? Gasp! It seems semi-disjointed and random but they are all pretty fun topics so I'm happy I picked this chapter to end the year with! We already finished the city/state/country/continent portion, and I will have to put up pictures of that soon... but today we began the landforms portion! I was planning on spending the weekend making a landforms freebie, but the more I thought about it, the more I knew I could just use what I already had to make the same thing I was planning on spending hours creating. I just folded a piece of construction paper, folded up six pieces of regular notebook paper, and stapled it together. Actually I had two kids in for recess detention today, so we had a little assembly line going on. Over the course of our mini-unit on landforms, we're going to learn about 8 different kinds of landforms. 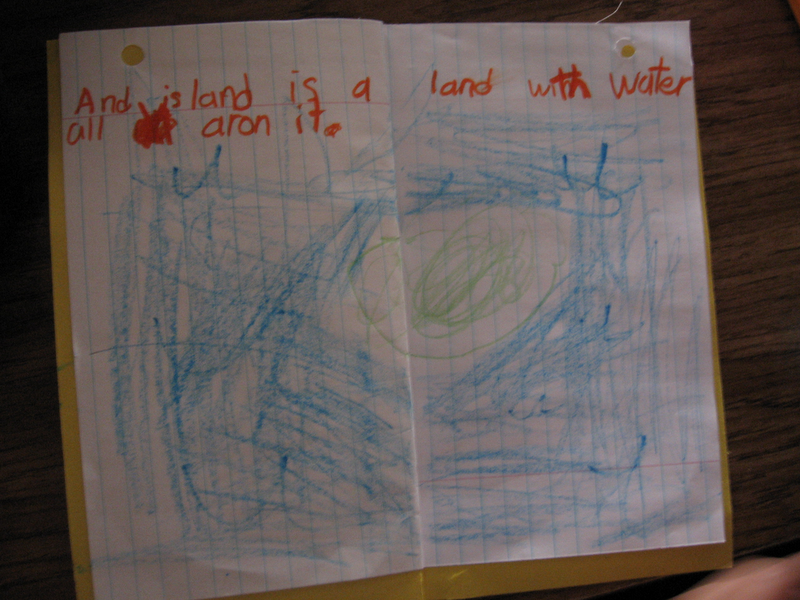 For each one we learn about, the students will write a sentence explaining the landform and draw a picture of it. Today we learned about islands and peninsulas. I didn't take any peninsula pictures, but here are some of the island examples. I had them skip the first page of the book so we could make a table of contents when we're finished with the whole book, but I didn't tell them that part right away. When I told the class about skipping the first page, one girl said, "Hmm... I'm thinking on that first page we might want to write, 'A landform is.....' and fill in the blank." I said, "Well, I was thinking we could make a table of contents so you can refer to the right page when you want to teach other people about landforms." "A table of contents?????????" she cried. "Wow!!!!!!!!!" They are PSYCHED, seriously, about filling up this landform book. I am psyched about seeing how much they are absorbing about landforms. So far they've learned that the S in "island" is silent, and if you pronounce the S, their teacher will get mad. And they know that Florida is a peninsula. Haha! But for reals, it's been a great way to liven up Social Studies!! LOVE the girl who is so excited about the table of contents - may I borrow her ... please?? ?